This Mediterranean fusion of flavors works well as a marinade or salad dressing. In a medium bowl, whisk together oil, Vinegar, Pesto Sauce, garlic and sugar. Season with salt and pepper to taste if desired. Pour 1 cup into a plastic resealable bag for marinating and reserve remaining 1-1/2 cups for salad dressing. Place chicken into bag, turning until evenly coated. Close bag and marinate in refrigerator for 1 hour, or overnight if desired, turning occasionally. Preheat grill on medium heat. Remove chicken from refrigerator, discarding marinade and bag. Grill chicken for 8 to 12 minutes, or until cooked through and internal temperature reaches 165°F, turning occasionally. Allow to cool for 5 minutes and cut into slices. Meanwhile, in a large bowl, combine salad greens, cucumber and onion. 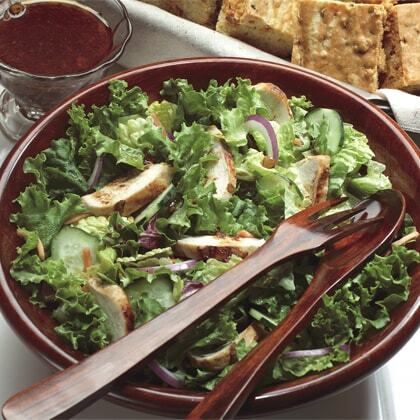 Pour in reserved salad dressing and toss until well coated. Divide between 4 plates and top with sliced chicken. If preferred, place marinade/salad dressing ingredients in leak-proof jar or container, and shake vigorously until well mixed.